Limmattalbahn to extend to Baden? 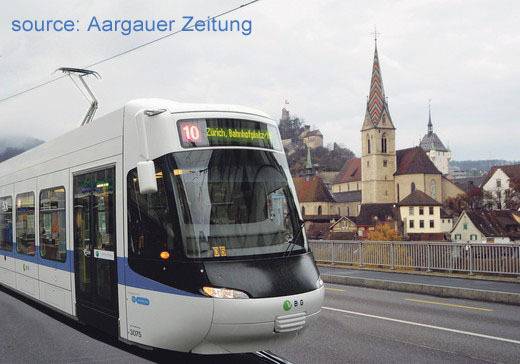 This webiste has in the past reported on the Limmattalbahn project to build a tram line from Zürich Altstetten to Killwangen Bahnhof. This is now making good progress with an opening for 2019 envisaged. For a more distant horizon, an extension to Baden via Wettingen is also on the wish list. This option has now taken an important step forwards with the cantonal parliament of Aargau agreeing to invstigate four routing variants in the Wettingen/Baden area. The line would have to cross the Limmat river twice and find its way through the Baden/Wettingen conurbation to terminate in central Baden. The securing of a corridor will effect future development projects. The article in Aargauer Zeitung has a sympathetic impression of a Glattal Cobra crossing the Hochbrücke Limmat bridge in Baden (a view I considered worth sharing here despite white Cobras having already featured markedly in recent news items). It is also being suggested that at its Zürich end, the line should not terminate at Bahnhof Altstetten as previously suggested, but continue into central Zürich (and maybe even to Tiefenbrunnen!). This would reqire it to use existing or planned tram tracks and so pre-empt any decison on the system to be adopted for Limmattalbahn (guided bus solutions have been suggested in the past as alternative to a tram).